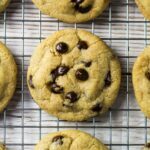 Vegan Chocolate Chip Cookies – Deliciously thick, soft and chewy chocolate chip cookies that are super easy to make, and are vegan-friendly! These vegan chocolate chip cookies are AMAZING. Seriously. 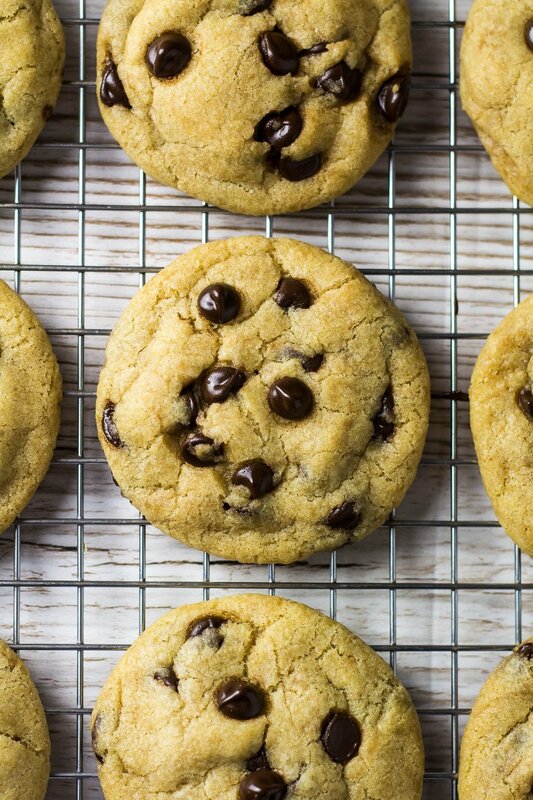 These cookies are super thick and chewy; they are irresistibly soft (and stay soft! ), and are stuffed full of melty chocolate chips. This may have become my new favourite chocolate chip cookie recipe. 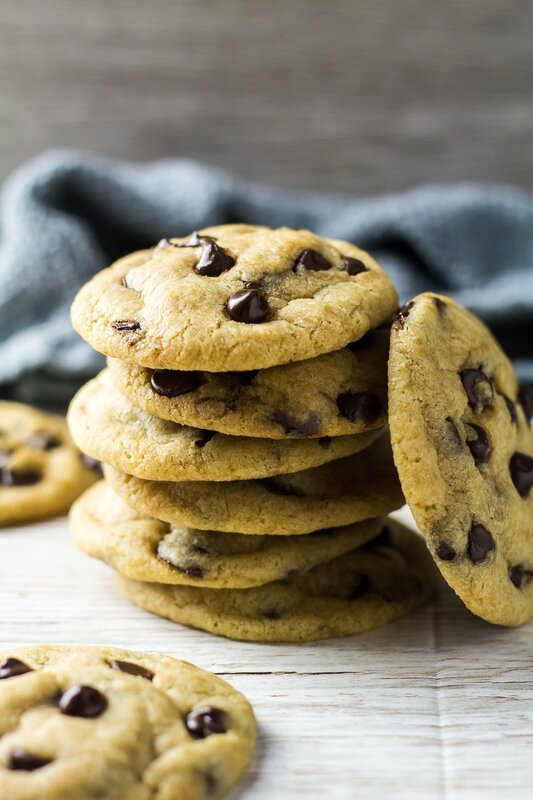 If you are looking for the perfect chocolate chip cookie recipe that also happens to be vegan, look no further. You are absolutely gonna love these! Coconut oil: Replaces the butter used in cookie recipes. Unsweetened applesauce: Replaces the eggs. In a separate bowl, whisk together the coconut oil and sugar until combined. Add the applesauce and vanilla, and mix until smooth and combined. Add the dry ingredients, and mix until just combined. Fold in the chocolate chips. At this point, the dough will be a little crumbly, but you should be able to bring it together with your hands. Roll the dough into 1.5oz balls, and place onto a baking tray lined with parchment paper or a silicone mat. Bake for 10 – 12 minutes. Do NOT over-bake. Slightly under-baking cookies is what makes them so soft and chewy after they have cooled. How long will these chocolate chip cookies last? These cookies will stay fresh, kept in an airtight container, at room temperature for up to 1 week. Can I freeze these cookies? Yes you can, but I recommend freezing the dough instead. Cookie dough balls can be kept in the fridge for up to 5 days, or frozen for up to 3 months. 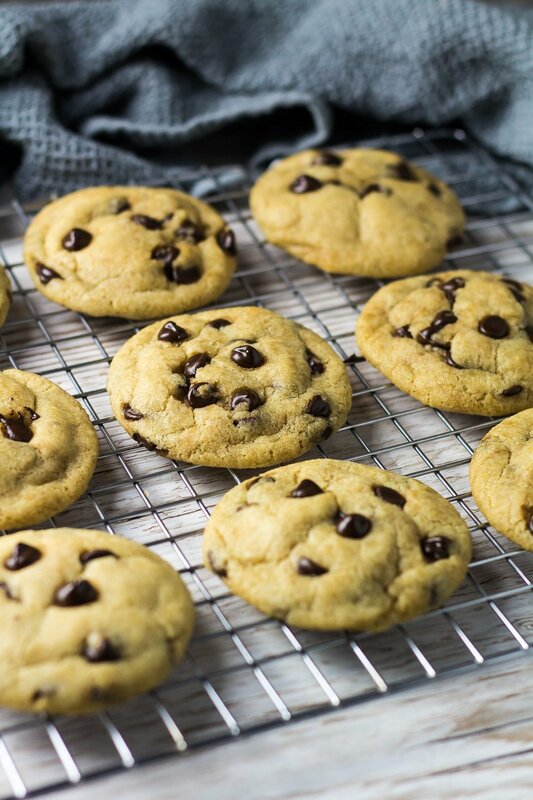 Bake straight from frozen for fresh cookies every time! Can you taste the applesauce in these cookies? Nope! Not at all. We are only using a small amount to replace one egg that would normally be used here. Why is my cookie dough crumbly? When folding in the dry ingredients, the mixture will become crumbly and may be hard to bring together with a spatula. BUT the dough should be easy to form together using your hands. You may also find it easier to form balls with your fingers instead of rolling the dough between your hands. If you do find it hard to even bring the dough together using your hands, add almond milk (or any milk you prefer), one tablespoon at a time, until the dough becomes easier to form. Try these vegan recipes next! 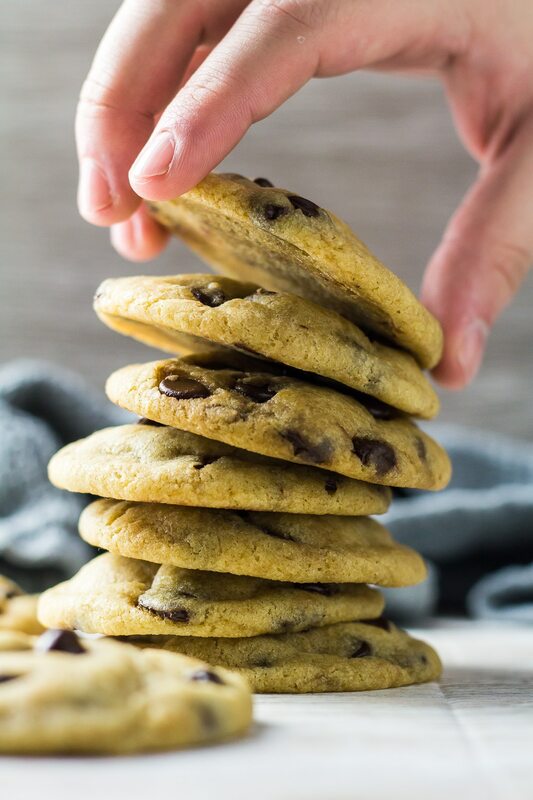 Deliciously thick, soft and chewy chocolate chip cookies that are super easy to make, and are vegan-friendly! Whisk together the coconut oil and sugar until combined. Add the applesauce, and vanilla, and mix until combined. Add the dry ingredients, and mix until just combined. Fold in the chocolate chips. The dough may be a little crumbly, but you should be able to bring it together with your hands. Would a flax egg work here? I’m not vegan, but I do love these cookies! Thank you for the delicious recipe! Everyone (even the non-vegans :-)) loved them! !